Parents taking kids on winter vacation have a lot to think about – including missing school, price and location, to amenities and activities. Should education be part of the consideration? A handful of ski resorts are recognizing the need to provide some sort of curriculum, to entice parents to visit during times other than popular weekends and holidays, which means kids will miss some school. Resorts are incorporating topics such as environmental awareness in to your child’s day on the slopes. Here are a few family-friendly resorts that will feature more than the standard “learn to ski” programs, teaching children new skills, offering outdoor adventures and the opportunity to make new friends. Kids will love Okemo Vermont’s “Snow Tracks”, a nature program designed to increase awareness of the animals that share this mountain environment. As part of Okemo’s children’s ski and snowboard lessons, kids tour the “Snow Tracks” stations, and discover how animals survive the long, snowy Vermont winters. Youngsters will come upon a Woodpecker tree, Bear Claw marks, a Snowshoe hare habitat and Deer rubbings. The chance to explore this “hands on” natural preserve on skis or snowboards is fun and exciting. The “Nature Zones” are accessible to everyone, a nature trail map is provided as a guide so you don’t miss any of the fascinating stops along the way. Okemo is educating not just children but “grown-ups” too on the efforts of ski areas to work in harmony with the environment to preserve it for generations. 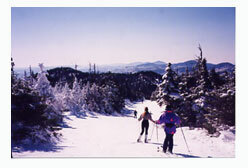 The family service spirit and gentle terrain of Okemo Mountain Resort makes it an easy choice as a family destination. Vail and Beaver Creek in Colorado have skiing nature paths through the woods, with signs educating kids on wildlife, animal tracks and native trees. Fun!. Smugglers’ Notch Family Resort has long been an industry leader of exceptional family programming. This year Smugglers’ debuts “The Science of Nature”, as part of the core curriculum of the “Snow Sports University”, an all-day ski and snowboard program. Kids ages 3-12 year olds will learn about weather and how Mother Nature makes snow at “Snowflake Bentley’s Weather Center”. Then in a step-by-step tour led by “Frostie the Snowmaker”, kids are taught how snow is manufactured. An interactive Nature Trail teaches kids about the forest animals and their habitats as they ski through life-like Bear caves. And as a sweet conclusion, kids get a taste of the century old tradition of maple sugaring. When the skis come off, the learning doesn’t stop. Smugglers’ hosts a weekly après ski Science Show featuring “Professor Alpine and Winter Wizard”. This wacky duo demonstrates how science and nature work together, and the kids laugh while they learn. Smugglers’ also offers a teacher-supervised Study Hall so kids can keep up with any schoolwork while vacationing. This year they are experimenting with utilizing e-mail so kids can turn in homework on time, or receive assignments from their teachers. In the evening, a Family Snowshoe Dinner means kids can join their parents for an adventure of snow shoeing to a woodland destination where a hearty dinner awaits them in the new Morse Highland Lodge. Youngsters that love the cast of animal characters at Sugarloaf can visit their alpine home, called “Moose Alley”. The secret kids-only entrance to this on mountain playground leads them to the home of Sugarloaf’s famed mascot, Amos the Moose. Kids can go inside Amos’ Cabin and read all about Moose habits and hibernation plans, then put their skis back on for a fun path of twists and turns called the Yard and the Rapids. Each turn is full of surprises, even animal sightings for the very observant skiers and riders. Families also enjoy the convenience and charm of the slopeside village at Sugarloaf. The National Ski Area Association (NSAA) is getting into the act of educating young skiers and riders on how to enhance their experience, and make it as safe and fun as possible with a new ambassador, “Snowball” the snow tiger. A cast of costumed forest mascots called “Snow Monsters” team up with Olympic champion Picabo Street and Aretha Franklin (in the role of Mother Nature) in a highly entertaining video about safety, courtesy and the seven item skiers’ Responsibility Code. “Snowball” and his friends can be seen parading the slopes at American Skiing Company resorts like Sunday River, spreading the message that “Safety is No Accident”. Robert Linde, NSAA’s Director of Marketing says, “We hope these Snow Monster characters become as well known to American children as Smokey the Bear and Mickey Mouse”. These are just a few of the on mountain programs being offered at ski resorts. The name “ski school” is truer today than ever before. Enjoying the great outdoors, while respecting and preserving our environment, is just one of the lessons being introduced in a friendly, fresh-air classroom. If nothing else it may help assuage your parental guilt while your kids are absent from a few days of school.